"The cruise ship industry is taking steps to try prevent seabirds getting stunned by bright lights at night and dying. Young seabirds are most of risk of crash landing on cruise ships during the night, DOC says. In a dramatic incident in Auckland last year, about 60 seabirds ended up on the deck of a cruise ship after being attracted by the vessel‘s bright lights. Some died because they were boxed up together and became distressed." Princess Cruising / Princess News & Princess Chatter / Federal judge threatens to ban Princess ships from docking at U.S. ports. Ed: I sailed on the Emerald Princess 3 days before the ship went into drydock. During my cruise the crew conducted a fire drill on deck 3. The fire fighters appeared to me to be well equipped to fight a fire in heavy smoke conditions. 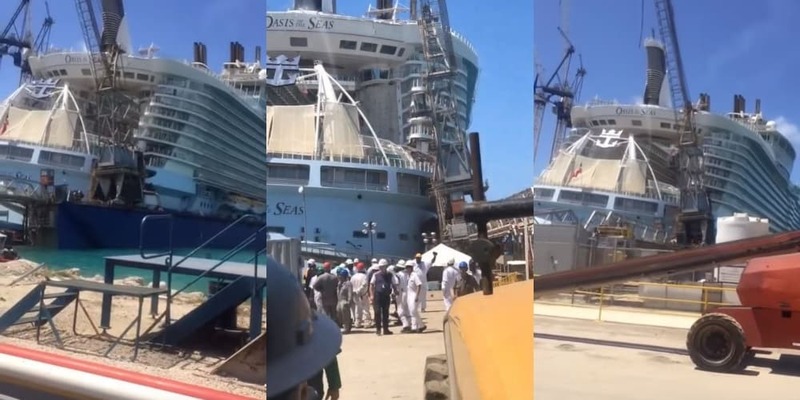 "A large crane has collapsed onto the Oasis of the Seas cruise ship during dry dock at the Grand Bahamas Shipyard in Freeport Bahamas."